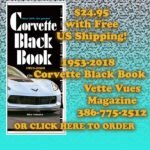 Corvette Black Book 1953-2018 Now In Stock! We just received the latest Corvette Black Book. Order yours before they are gone. $24.95 including Free US shipping! As the Corvette enters its 65th year, Chevrolet celebrates with the Carbon 65 Edition. Available with Grand Sport and Z06 coupes and convertibles, this $15,000 option includes new Ceramic Matrix Gray Metallic paint with blue door and fender graphics, blue calipers, and a slew of carbon fiber components. The interior has Jet Black competition sport seats with sueded inserts and blue stitching, and a carbon fiber steering wheel rim. The 2018 Corvette Black Book summarizes all that’s new with the 2018s, and wraps up 2017 production with interim changes and production counts for models, options and colors. It has changes to 16 pages compared to the previous edition. 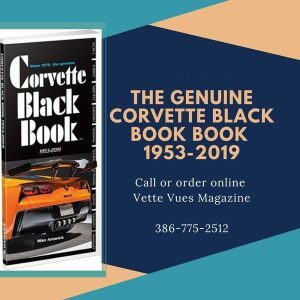 Introduced in 1978 with 60 pages a bit over 6-inches tall, the Corvette Black Book has grown over the years to 160 pages a full ten inches in height. Its beauty, like the car itself, is in its evolution. 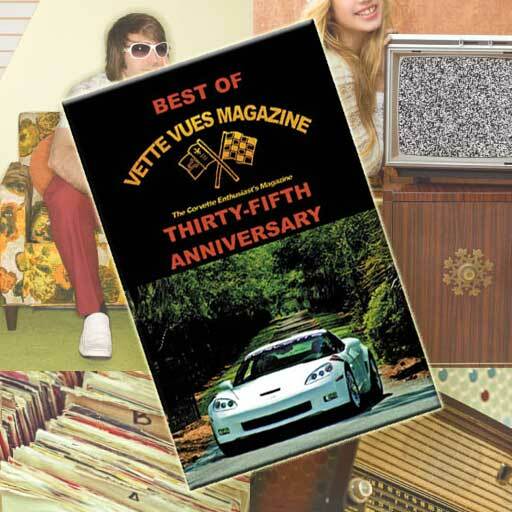 These are pocket-sized marvels with thousands of Corvette facts, options and option codes, exterior and interior colors and codes, production figures, serial numbers for body, engine, and component parts, and a compilation of each model’s unique details. The prices included are “window sticker” prices (the Corvette Black Book is not a guide to current values). By categorizing all this in a precise year-to-year format, the Corvette Black Book puts phenomenal expertise at your fingertips. In the Corvette Black Book, production quantities trail by one year. So in addition to 2018 introductory info, the 2018 edition includes 2017 quantities and running production changes. It’s all part of an endless effort to maintain the Corvette Black Book’s reputation for detail and accuracy. And the book is designed so that you can find what you’re searching for quickly. 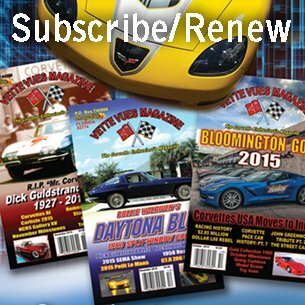 The Corvette Black Book and its publisher, Michael Bruce Associates, Inc., have no relationship or connection whatever with Hearst Business Media Corporation, its parent or affiliated corporations, or the Black Book published by the National Auto Research Division of Hearst Business Media Corporation. Michael Bruce Associates, Inc. and the Corvette Black Book are not associated with or sponsored by GM or Chevrolet Motor Division. $24.95 including Free US shipping! ORDER NOW!